Guidelines for Dog Tracking Enthusiasts. In every book on tracking, the importance of having (or being) a good, experienced track layer is stressed, but none devote more than a few pages to this important topic. How does a person learn to be a great track layer??? This book takes the mystery out of learning the fundamentals and associated skills needed to confidently lay great tracks for yourself or others. 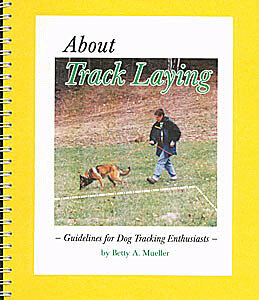 Gives the reader some basic ideas of what laying a track for a dog to follow is all about. It requires learning some relatively simple skills, but nothing beyond an average person's abilities. There are fun exercises to try on your own or with friends to test each other. A good track layer must be able to plot a track, draw an accurate map of that track, and knows exactly where the track goes. *This is NOT a book on how to train your dog to track!! It is expressly for teaching people the fundamentals of track laying and associated skills.